This pleasingly high-percentage chocolate is full bodied yet mild, decadent and incredibly smooth with hints of nuts and an extraordinary chocolate flavour, ideal for the chocolate purist. Cocoa mass*, cane sugar*, cocoa butter* and vanilla pods*. * Certified organic. Cocoa: 80% minimum. 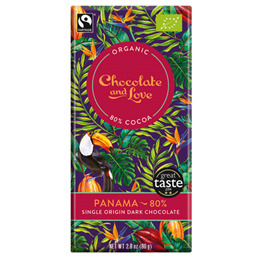 Below are reviews of Chocolate and Love Panama Organic Dark Chocolate - 80g Bar by bodykind customers. If you have tried this product we'd love to hear what you think so please leave a review. Just as delicious as the 71% Rich Dark bar. 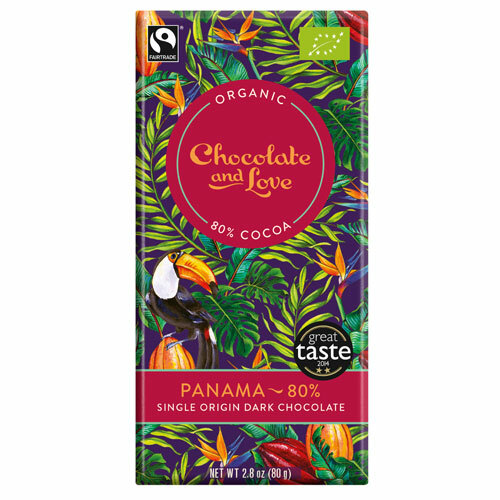 Chocolate and Love are our new favourite chocolate producers! I bought this chocolate bar as part of a corporate goody bags... and everyone loved it!!! First time I've had this chocolate... won't be the last.